Living close to Prospect Park! But…moving from here again soon. Love living in Brooklyn, but housing uncertainty is the new normal and it’s rough. 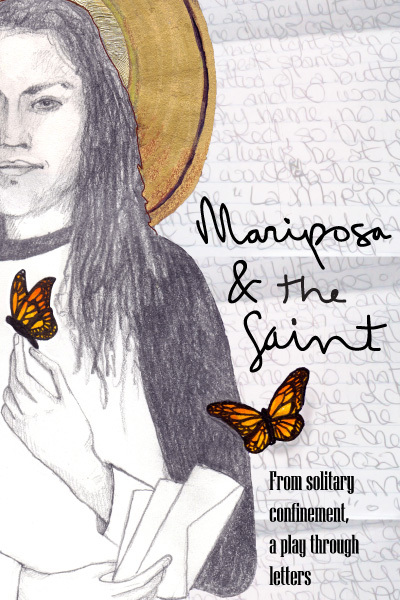 “Mariposa & the Saint” is a play written over two years of correspondence, between myself and Sara (Mariposa) Fonseca, while she has been in isolated confinement in a California women’s prison. The text of the play is derived entirely from her letters. Every performance is followed by a dialogue on solitary confinement, and the current campaigns to end it. Directed by Noelle Ghoussaini. In May I bring “Mariposa & the Saint” to California, performing at: UC Berkeley, SF State, Stagewerx in SF, La Peña in Berkeley, benefit shows for the California Coalition for Women Prisoners (CCWP). Spring! Radical imagination, youth-led protests all over the world, my 97-year-old grandmother, getting close to a rough cut of our documentary film…I just saw Niagara Falls for the first time! Police killing people. The Drug War. Mass incarceration. Fracking. Capitalism. Murder of trans people. Ongoing genocide of indigenous people. Poverty. Racism. Greed. Lack of curiosity or imagination. At a Solidarity Board meeting for Community Action for Safe Apartments-housing justice in the Bronx! Walking for miles around NYC. Doing admin for my art. Doing a shift at the Park Slope Food Coop! Julia Steele Allen is an activist, organizer, award-winning playwright, performer, and musician. She is part of the musical duo My Gay Banjo. She is a co-producer/ writer of the documentary film: “Decade of Fire,” about the burning of the Bronx in the 1970’s. She is currently performing a play about solitary confinement she wrote through letters with a friend in prison, called “Mariposa & the Saint.” She worked for ten years on educational justice campaigns with the dedicated mothers of District 9, and is now editing a sci-fi/ fantasy trilogy she wrote entirely on the subway.